In a quick exchange with another shopper today, I must have apologized for getting in his way, because I remember hearing him say in response, “no worries.” That caught my attention. I say “no worries.” I picked it up years ago from a British friend who charmed me with her casual expression and beautiful accent. I’m going to share another experience from today that had me rejoicing over the fact that there really are “no worries” in this heart of mine. I went to my yearly mammogram appointment and left without any concern over the possible results (even though I have a family history of breast cancer). Why don’t I worry? Because greater than the ability of Riverside Imaging to look at the body’s tissue, my God, who crafted my physical design, sees every intricate component of my entire being, and He speaks peace over me today! Peace I leave with you; my peace I give you. I do not give to you as the world gives. 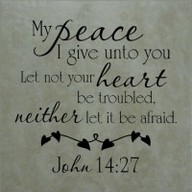 Do not let your hearts be troubled and do not be afraid (John 14:27). So, if you’re thinking, “I understand Jesus said those words, but what makes them real in my life?” I believe the manner in which these words manifest in our lives is through the practice of recognizing the presence of God. Throughout all of Scripture there are recordings of God speaking peace to His servants, and that peace is based upon His presence with them. In the John 14 account above, Jesus was actually preparing His friends for His departure but advising them to take heart because by His going to the Father, the Holy Spirit would come to earth in His place. This is even better for the believers. Now He is truly with them at all times, because He is in them. And the same is true for all believers today. So, I literally left the medical office with a smile on my face because the Prince of Peace is with me, and He sees and knows all things. He is intimately aware of all of my life’s dealings, and His compassion for me is my security. Friend, I deeply desire that you abide in this peace of God. Yesterday I wrote about finances, and today I am inspired to write about health. God is on the move in your life to free you from worry. Take His hand and go His way. You can trust Him.